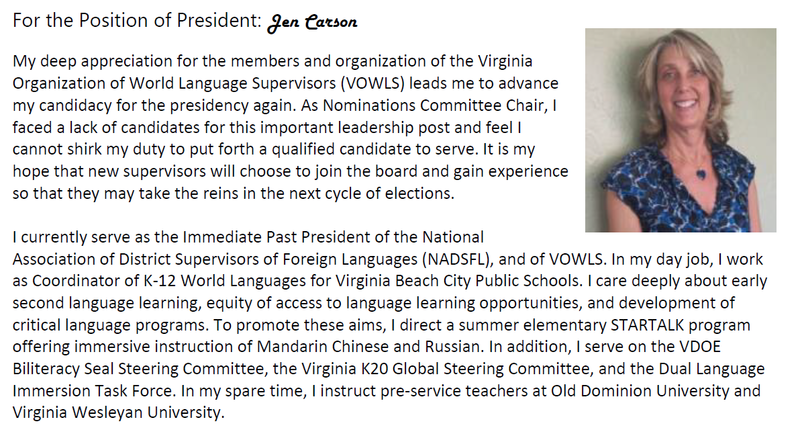 If you arrived to this page looking for the Virginia Foreign Language Supervisors Association (VFLSA), do not fear! 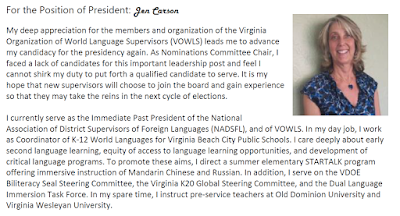 We are still here, but under our new name VOWLS - the Virginia Organization of World Language Supervisors. Voting for VOWLS is now open! Please use the VOWLS 2019 ballot to cast your vote for the offices of President and Secretary. See "Meet the Candidates" below to see who is on the ballot. Voting is open until Thursday, February 28. VOWLS Institute on March 2, 2019 has been cancelled due to unforeseen circumstances. Thank you for understanding. 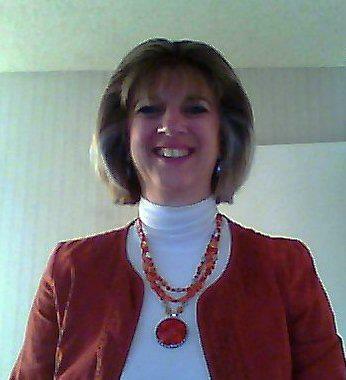 We hope to reschedule with Leslie Grahn next year. Officer Nominations: The VOWLS Nominations Committee has extended the deadline until 2/24/19! Please consider nominating yourself or a qualified and deserving colleague. Taking a leadership role in VOWLS is a great opportunity to grow professional while supporting an organization you value. It is time to step up! Taking a leadership role in VOWLS is a great opportunity to grow professionally while supporting an organization you value! Consider nominating yourself or a qualified and deserving colleague. See Elections and Offices below for more information including the nomination form. HB215 was defeated in subcommittee. Thanks to all who contacted legislators in your region to help defeat this bill. HB2037: Del. Foy has submitted a bill for diversifying the teacher workforce that would allow superintendents to recommend teachers on provisional license who have attempted to pass VDOE prescribed teacher assessments unsuccessfully, for licensure. Look for updates in upcoming days. We are celebrating the passage of HB507 and HB1156 this year thanks in part to VFLSA advocacy! We are keeping a close eye on HB443 which has raised some red flags. Please reach out to your legislators to share your opinions! VOWLS would like to extend a big thank you to our annual meeting sponsors! Voting is now open! Be sure to cast your vote for President and Secretary prior to the annual meeting to be held Friday, March 1, 2019. Nominations are now closed! The VOWLS Nominations Committee has extended the deadline until 2/24/19! Please consider nominating yourself or a qualified and deserving colleague. Taking a leadership role in VOWLS is a great opportunity to grow professional while supporting an organization you value. It is time to step up! Election will be held online prior to the Annual Meeting on March 1, 2019. PRESIDENT: VOWLS President sets the agenda for the Annual Meeting, presides at all meetings, calls meetings of the Executive Board, keeps the membership informed of important issues concerning world languages, serves as the official representative to FLAVA and other organizations, serves as the liaison with the Virginia Department of Education’s world language specialist and monitors progress of world language issues and legislation before the Virginia General Assembly and the Virginia Board of Education. SECRETARY: VOWLS Secretary records and posts minutes of all meetings within a month of the meetings, maintains an orderly and accessible file of the official records of the Association, and handles all official correspondence for the Association. The officers shall be elected for a term of two years. No officer shall serve more than two consecutive terms in the same office. The offices of President and Secretary shall be elected in the odd years; the offices of Vice President and Treasurer, in the even years. For complete information concerning election procedures and responsibilities of each office, consult Articles V and VI of the VOWLS Constitution. The VDOE publishes a regular newsletter for world language educators. Sign up here!